Fig. 1. Tinos, Pentostrato, monastery of Saint Francis (photograph D. Roubien). Architectural typology and morphology of the mud brick, transferred to a stone construction. After the fragmentation of the Byzantine Empire by the crusaders of the 4th crusade, most of the Cyclades islands were conquered in 1207 by Marco Sanudo the Venetian nobleman, who formed the Duchy of the Archipelagus, with Naxos as its centre. Tinos and Mykonos, however, were not part of this state, but that same year came under the two Venetian brothers Andreas and Jeremiah Gizi. This small state remained in the hands of the latter’s heirs and successors till 1390, when Venice took over the direct administration of the islands. Unlike what had occurred in most places in Greece under Frankish rule, where Catholicism was represented only by the feudal aristocracy of the conquerors and part of the local aristocracy, in Tinos as in Syros, the majority of the population (almost its entirety in Syros) followed the catholic faith. All the same, it has not been clarified under what conditions and at what pace this had happened. Until the end of the 17th century, the Catholic Church did not have monasteries in Tinos (note 1). Similar efforts had been made in the past, but the Venetians did not favour the creation of such institutions that did not come under their direct control. In the rest of the Cyclades there were already several monasteries, mainly Jesuit and Capuchin, since all the other islands had already passed under Turkish rule, essentially since 1537 and officially in 1579. Therefore, not only did the Venetians’ prohibitions no longer apply there, but, on the contrary, with the treaty signed in 1535 between Francis 1st King of France and the Sultan Suleiman, known as the Magnificent, all Catholics living in the Ottoman Empire were placed under the protection of the king of France. Under this treaty, French Jesuit and Capuchin monks settled in districts with a catholic population. The official purpose of this settlement was to be of service to the catholic flock, but at the same time it had an unofficial objective, namely cultural −by spreading the French language– and ultimately France’s political infiltration into the Ottoman Empire. 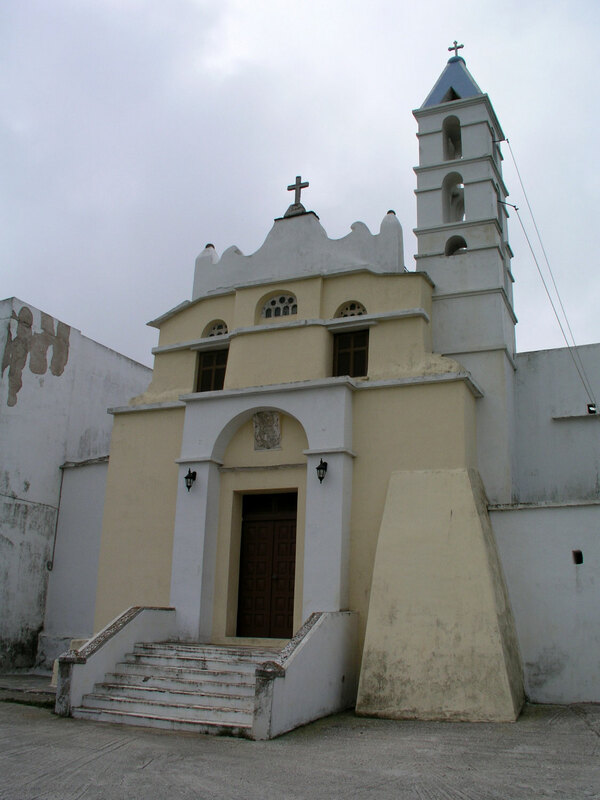 Tinos, however, which remained under Venetian rule till 1715, as the last bastion of the Christian West in an Aegean under the Turks, as of that year, came under the same status as the other islands of the Cyclades, regarding the activities of the catholic monastic orders. Thus, till 1660, the only monastic presence in the catholic community of Tinos was that of some unusual nuns who led monastic lives at home. In 1660 the Venetians permitted the first monastery to operate in Tinos. It was that of the Jesuits. They were followed by the first Franciscans who arrived in Tinos in 1698. The monastic order of the Franciscans or Friars Minor (Minorites) was founded by St Francis of Assisi in his birth place in 1209 and was recognized by Pope Innocent III in 1210. The monastery of St Francis was built in 1700 in a location called Pentostrato, near the village of Mesi, in the middle of a plateau, three kilometers outside the walls of Xoburgo, medieval capital of Tinos. According to the prevailing theory, its construction was realized thanks to the donation of a lot of land by a wealthy Maltese doctor, married to a Tinian and living on the island. At first a small church was built, while the first community was made up of three monks. In 1703 themonasteryjoinedtheecclesiasticalprovinceofVenice. In 1715, the monastery was seriously damaged during the occupation of Tinos by the Turks and the monks abandoned it. Until 1721 the Franciscans had lost their owner ship of the church, which they regained after Christian diplomats intervened. They soon returned however, taking the Jesuits under their roof, whose monastery had been entirely destroyed by the Turkish invasion. Since that time the monastery was annexed to the central monastery of Santa Maria Draperis in Constantinople. At its peak (till the mid 18th century), the monastery had around 10 monks. In 1792 the present monastery was built on the site of the original one (fig. 1). It is a domed basilica with a single nave and three sanctuaries (ιερά βήματα) that have access to each other, in cases when different priests celebrate the holy service simultaneously. Following financial support from the monastery in Constantinople, the monastery was repaired and developed up to 1923. A fire that broke out that year destroyed it completely, but the Franciscans re built it. In 1927, a fire destroyed the monks’ cells, the church however was saved. Today the monastery belongs to the Catholic Archdiocese of Naxos and Tinos. Recently, the building complex was restored. In 1747 the Franciscans founded one more monastery in the island’s new capital, the Chora of Agios Nicholaos which replaced Xoburgo, that had been destroyed by the Turkish conquest. This monastery is dedicated to St Antony of Padua (fig. 2). A feature of both monasteries is their difference from the dominant architectural style of Catholic religious buildings in Tinos, which usually follow a simplified version of Italian Baroque. This influence is to be expected, given the island’s history. Churches with Baroque elements (mainly on the façade) continued to be built both during Turkish rule and after Independence. In fact, although many of today’s churches were built during Venetian or Turkish rule, they acquired their present form in the 19th century, after Independence, retaining however their Italian influences, despite having ceased direct relations with Venice. Unlike the parish churches that fall under the jurisdiction of the local bishop, which in turn places them under respective local architectural influences, the monasteries are often subject to centres located a long distance away , as is the case of these Franciscan monasteries. This also leads to corresponding influences in terms of their architecture. In the case of the Pentostratos monastery, the difference lies mainly in the church’s exterior, which shows influences totally foreign to any model not only from Tinos and the rest of Greece but from the whole of Europe as well. Specifically, the models are clearly related with the Franciscan missionary churches in New Mexico! The Spanish missions in New Mexico were a series of religious outposts in the Santa Fe province of New Mexico. At the time, New Mexico was part of the Vice royalty of New Spain (today’s Mexico). 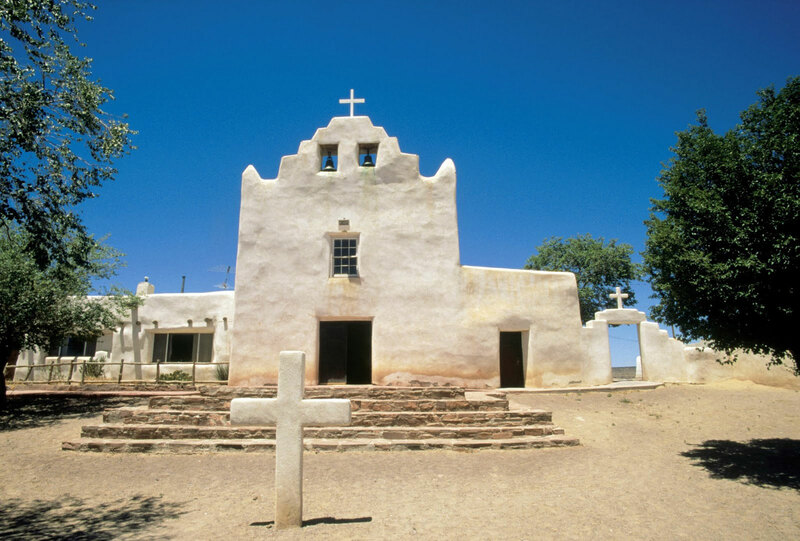 The missions of New Mexico were founded by Franciscan monks at the instigation of the Spanish kings, to convert the local populations, that included the Navaho and Apache, to Christianity. This conversion aimed at restricting the native populations’ resistance to the Spanish conquest. The missions introduced new animals, plants and small scale industry to the region, making themselves self sufficient units. The first of such missions were founded in the 16th century and increased visibly during the 17th. Most churches however date from the 18th century and come from the rebuilding of older churches destroyed by natural causes or the Indians’ uprisings. It is not known in what manner these architectural prototypes came from such a distance, the fact however that it was the same monastic order, can be no coincidence. It must be assumed that some designs were transported by monks of these missions to Europe, possibly to some central monastery of the order, where it was seen by some visiting monk from the monastery in Tinos, who probably took them with him back to the island. It is worth noting that the Pentostratos monastery copies an architectural type that could never flourish in Tinos, since there are no materials on the island necessary for this particular one. 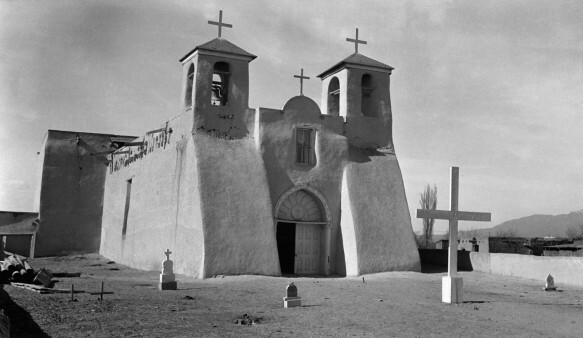 In contrast, the churches of New Mexico had a form that results directly from the materials used for their construction. Thatistheyaremadeofmudbricks, the most common building material in these areas which are arid and have large flat expanseswhere there is plenty of soil, but no stone. As a result, these churches are made with extremely thick walls, a basic feature of mud brick architecture. In fact, the structure’s thickness is particularly evident in the tower belfries that often frame the church entrance (fig. 3). Moreover, the upper structure is frequently narrower, which is encountered more often in mud brick walls from prehistoric times to the present (e.g. in Africa or the Arab peninsular) for reasons of stability in construction. In Tinos, on the contrary, the Franciscans’ church copies the morphology of its Spanish models without using the same materials. This is to be expected, since in Tinos stone rather than soil is abundant, making it traditionally the most common building material.Surprising though, despite the inability to use the same material, the Tinian church copies the distinctive form of the extremely bulky tower with its pronounced narrow upper part, while the volumes of the building in general also decrease higher up, which is a feature of New Mexican churches. These forms are deceptive regarding their construction material, as they do not correspond at all to stone, while on the contrary they are a distinctive feature of the architecture they are imitating. This is a great paradox in the midst of an architecture known for centuries for its impressively wise adjustment to local conditions and possibilities, utilizing local materials, always the most economical solution. The choice made in the church of Saint Francis is evidence of an especially strong wish to realize this particular prototype, ignoring possible obstacles that arise from the absence of suitable materials. Proof of this hypothesis is found in various other morphological details that are foreign to local tradition. The most distinctive is the “pediment” on the facade which shows an impressive similarity with the pediments of the churches of San Jose in Laguna, New Mexico (fig. 4) and San Francisco in Taos (fig. 5). Here we have raised edges,in contrast with the respective pediments of Baroque churches on the island (among which is the other church of this order in the Chora of Tinos), where the alternation between curved and concave shapes lead to a steady descent from the top of the pediment towards the two ends, in complete harmony with the numerous examples of Baroque facades throughout Europe. The belfry comes in sharp contrast with all these elements, since it alone faithfully follows the local tradition, resembling the majority of the very distinctive belfries of the island, as if it belongs to another building. 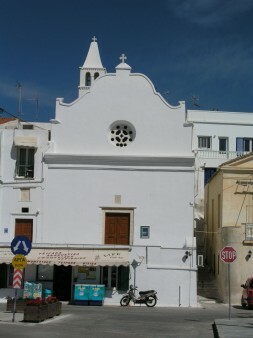 In the case of the second Franciscan monastery in the Tinos Chora, the façade is a typical example of Italian Baroque, without any resemblance with the church of Pentostratos. On the contrary, the architecture here differs on the inside and specifically in the chapel found to the left of the central nave (note 2). 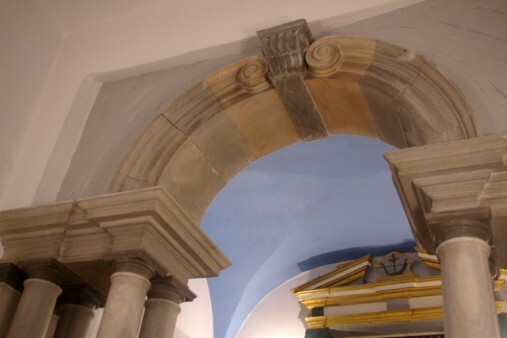 This includes a marble construction that makes up the entrance to the chapel’s apse (figs. 6, 7, 8, 9). For a start, the construction is unusual in the use of a grey marble that does not seem to come from Tinos. This is particularly strange on an island with a large production of marble which resulted in a huge number of constructions. These were definitive in the 19th century in consolidating and perfecting the classical technique throughout the whole Modern Greek state and beyond, over the entire Greek world, through the orders made by Greeks of the Diaspora. Thedifference, however, wasmainlymorphological. The perfection in execution was unique in Turkish occupied Greece of the 18th century and is the complete opposite of the roughness of local traditional marble work of the time. This can be observed in all the relevant examples, culminating in the famous skylights which in that period were in shallow relief and roughly carved.Moreover, the morphology of construction in the chapel of Agios Antonios is unique. The smooth Tuscan columns, placed in pairs, the architrave with its recesses and protrusions, as well as the very large spirals are all typical examples of the Mannerist technique. The prototype was the Laurentian Library in Florence (1519-1534) (fig. 10) designed by Michelangelo who introduced this particular morphological vocabulary and which was dominant in Italy during the second half of the 16th century and after, constituting the forerunner of the Baroque. InTurkishoccupiedGreece, of the 18th century,however, these forms were completely unknown and the absence of other such examples confirms it.This uniqueness in terms of morphology, combined with the spectacular difference in quality of execution between this example and all the local production of the era, lead to the conclusion that the specific work, as a whole, must have been made elsewhere, came in sections that were then assembled, most probably from Italy, taking into consideration the historical bonds between it and Tinos. Only a few decades later, with the creation of the Greek state and the establishing of classicism, Tinos “supplied” the capital with eminent sculptors and craftsmen of marble, who showed they could adapt extremely quickly to the passage from rough treatment of surfaces in traditional marble craftsmanship, to perfectly treated surfaces of the marble members of neoclassical buildings they built and the sculptors that created. Such a passage is not obvious. The break with local tradition was the main problem created with the establishment of classicism and what the latter was most accused of. 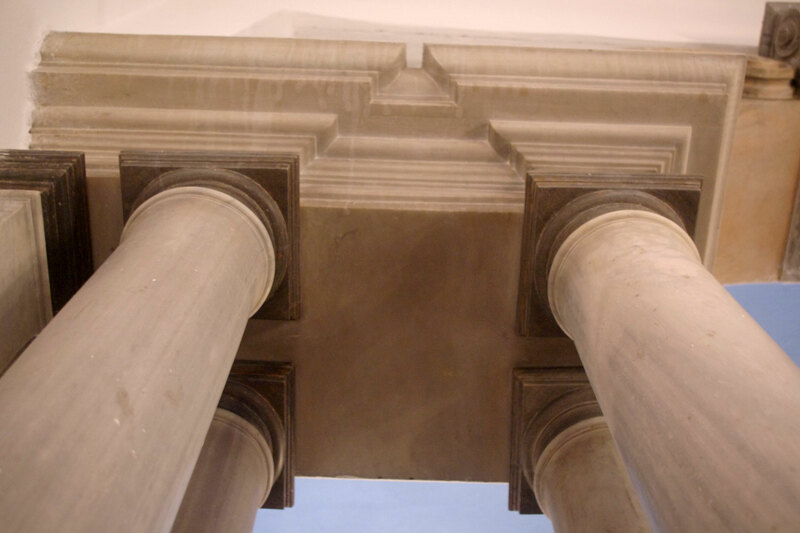 The most basic feature of traditional architecture and the related arts was the so called “graphic irregularity” (γραφική ακανονιστία) that was the exact opposite of the perfectly treated surfaces of structures of classical antiquity. Graphic irregularity is the characteristic point of rupture with antiquity and marks the moving on to the Middle Ages, to a society with a different world theory and therefore different aesthetic principles. In Medieval Art (whether speaking of the Middle Ages in the West or of Byzantium) what counts is the overall impression of harmony in a building or a work of art. This has its roots in theology and stems from fundamental differences between the world theory of the ancient world and the Christian one. 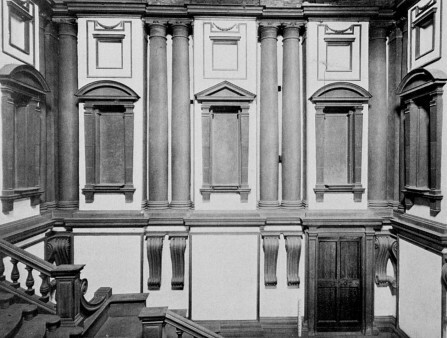 Regarding official architecture, the ancient preference for perfection in the treatment of details returned to the West with the Renaissance. In Greece, however, so called “minor” or “anonymous” architecture and art, the continuation of the medieval tradition, were essentially the only artistic expression in Greece during the time of Independence, especially since the new Greek state was formed by the poorest regions and those that were the most sparsely populated and isolated from the big centres. There, all forms were unknown other than those of tradition. Consequently the Modern Greek state enthusiastically adopted classicism as the most suitable movement to reconnect with its ancient Greek past ,summarily dismissed traditional forms and techniques, considering them −wrongly of course− as examples of “barbarism” brought about by Turkish rule and turned to forms inspired by classical antiquity, seeking the architects, artists and craftsmen who would realize them. 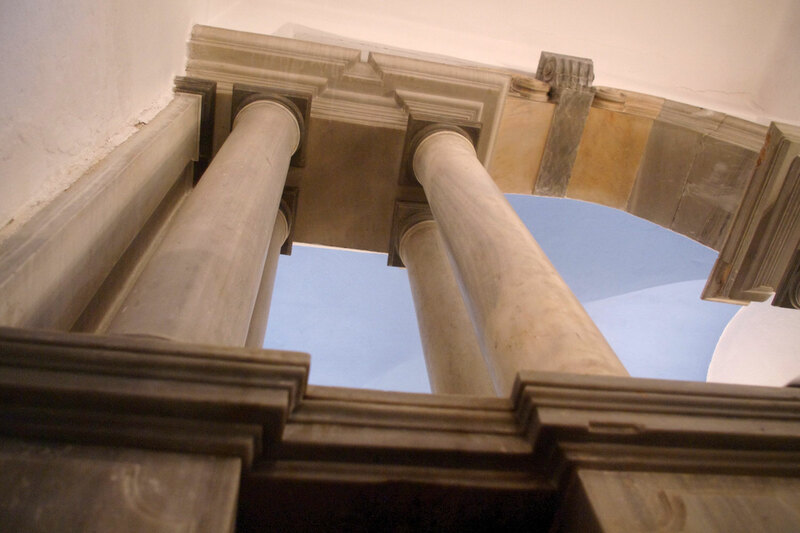 The Tinians responded remarkably quickly to this change and moved with a distinctive facility from rough traditional forms to perfectly treated classical forms, establishing Tinos as the basic ‟provider” of the capital, among other places, with the appropriate human resources. 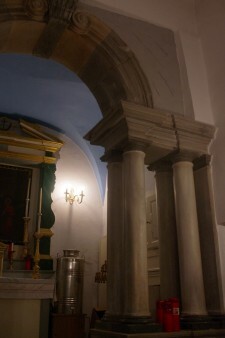 This surprisingly quick adjustment, combined with the previously mentioned unique example of the chapel of the Agios Antonios church, rightly creates the suspicion that the Mannerist construction of the 18th century must have played some ‟educational” role, also taking into account its key location in the island’s port. Moreover, according to present data, for decades it was the only example of a large marble construction on the island, that was part of the European classical tradition, in the broadest sense. This, of course, is a subject for investigation and should be the object of future research, since indeed, the lost archives of the Agios Antonios monastery were recently rediscovered (note 3) and their study may throw some light on the subject. Regardless of this, however, the marble entrance of the chapel with the excellent quality of its construction and its singular morphology –even today− is a rare monument that deserves more attention. 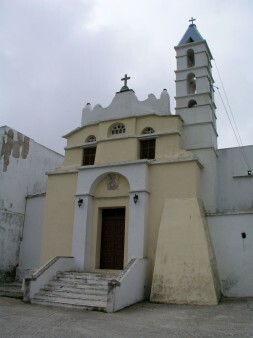 Both Franciscan churches with the distinctive architectural features described, are moreover proof of the considerable cultural wealth of Tinos , disproportionally large compared to the island’s size. We owe this wealth to the unique historical circumstances that gave Tinos an entirely separate role, as a bastion of Western civilization in the East Mediterranean, at a time when this civilization was under tremendous pressure and in danger of disappearing from its birthplace. 1. Χάρης Κουτελάκης, Ο δυτικός μοναχισμός στα Πάνω Μέρη Τήνου, Τήνος Εώα και Εσπερία. Πάνω Μέρη Τήνου, Athens 1999, p. 146. 2. Warm thanks are due to Father Marko Foskolo, chaplain of Agios Nikolaos in the Chora of Tinos, for his wealth of oral information. Also for his initial pointing out of the unpublished to date marble construction of the chapel of the Agios Antonios church ,that led to its investigation by this writer. Likewise thanks are due to the Catholic diocese of Naxos and Tinos for facilitating the visit to the chapel and its being photographed. 3. The lost archive was recently located in the archivesss of the Capuchin monastery in Athens: Father Nikolaos Roussos, The Archive of the Monastery of Agios Antonios in Tinos, paper at the 1st National Historical Conference in Tinos, 2015, ‟From Tinos of the Venetian Doge, to Tinos of the Sublime Porte” [Από την Τήνο του Βενετού Δόγη, στην Τήνο της Υψηλής Πύλης]. Α’ Διεθνές Ιστορικό Συνέδριο Τήνου, 2015, «Από την Τήνο του Βενετού Δόγη, στην Τήνο της Υψηλής Πύλης». Κουτελάκης Χάρης, Ο δυτικός μοναχισμός στα Πάνω Μέρη Τήνου, Τήνος Εώα και Εσπερία. Πάνω Μέρη Τήνου, Athens 1999. Ρούσσος-Μηλιδώνης Μάρκος, Ιησουίτες στον ελληνικό χώρο (1560-1915), εκδόσεις ΚΕΟ, Athens 1991.
π. Φώσκολος Μάρκος, newspaper «Καθημερινή», 15th August 1993. Taos Lodgers Association, Historic churches of Taos and Northern New Mexico, Albuquerque 2011. 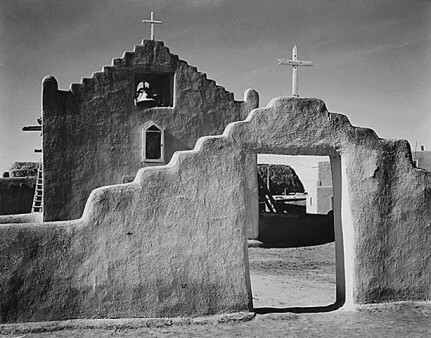 Treib Marc, Sanctuaries of Spanish New Mexico, University of California Press, Berkley 1993. Χαριτωνίδου Αγγελική, Τήνος, Ελληνική Παραδοσιακή Αρχιτεκτονική, vol. 2, Κυκλάδες, εκδόσεις Μέλισσα, Athens 2001.